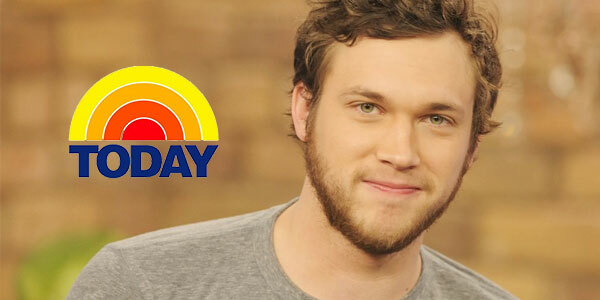 Don’t miss Phillip Phillips when he will appear on The Today Show on June 28th, 2013. The Today Show will begin it’s “Toyota Summer Concerts Series” on May 24th, 2013 and go thru to August 30th, 2013.
basis. Outside of the Today Show window on the World Studio @ 40th Street and Rockefeller Center. If you live in New York City or plan to visit try to be there at 6AM. Click HERE for passes to attend the Summer Concert Series in person. With the success of his debut single, “Home,” Phillip Phillips isn’t just the dude who won “American Idol.” He’s the dude with that folk-rock hit, according to the fans he’s met. “People are like, ‘You’re the guy with the song “Home,’” and I’m like, ‘Yeah, yeah.’ They say … ‘So do you have any other music out?’ I’m like, ‘There are some covers.’ ‘What from?’ I say, “’American Idol.’” ‘You were on “American Idol”?’” he recalled. The star power for winners on “Idol” — or other singing competitions on TV — don’t usually continue after the season’s run, but Phillips is hoping he won’t be one of those stereotypes, thanks to the success of his multiplatinum Top 10 hit and debut album, “The World From the Side of the Moon,” which debuted at No. 4 on Billboard’s 200 albums chart this week after selling 169,011 units, according to Nielsen SoundScan. The song — the only one he didn’t write or co-write on the album — also got a boost when it was used in commercials for the Fierce Five, the five American female gymnasts who scored gold during the Olympics. The 22-year-old talked about his music, being laid-back and the insta-family and friends who have surfaced since he won the “Idol” crown in an interview with The Associated Press. AP: What do you think of the comparisons of “Home” to Mumford & Sons’ music? Phillips: People are always gonna compare somebody to somebody else, but I think when people hear the album it’s not gonna remind them of Mumford & Sons too much because I’m a little more rock and you know they’re very folk and they’re amazing. … I think once they hear this album it’s gonna turn their heads a little bit. Most “Idol” winners haven’t had success like Kelly Clarkson or Carrie Underwood. Does that make you nervous? I mean if it doesn’t do well it wasn’t meant to do well … I’d be upset for a little bit, but it’s just what it’s meant to be. I can only hope for the best. I can’t make anybody do anything. I’m nervous about it definitely, but all I can do is hope that it does well. What do you think of the new “Idol” judges? I’m curious to see how they’re gonna judge and to see what they’re looking for. Keith Urban is an amazing musician so that’ll be cool to have him. I’m doing great. I’m tired, but staying busy. This reminds me, I have to get a doctor’s checkup. You were so low-key about your health issues while on the show. Was that intentional? I didn’t want people to feel sorry for me or anything on the show or vote for me for sympathy or anything like that, so I tried to keep it on the DL as much as I could, but the show likes that kind of stuff and they said, ‘We’re gonna put it (out),’ and I can’t really say no because I signed some papers that they could show just about what they wanted to. So, yeah, I tried to keep it as low-key as possible. Do you find a lot of people came out of the woodwork after seeing you on “Idol”? iHeartRadio hung out with Phillip Phillips in NYC, where the musician divulged everything from his favorite songs for a road trip to what he sings in the shower. Find out what makes him tick and whether he really thought he was going to win Idol – in his own words. Check out what he had to say on winning the show, his name and more. Check out Phillip Phillips in studio with Lulu y Lala of the ‘Ty Loves NY’ Morning Show on 92.3 NOW in NYC.